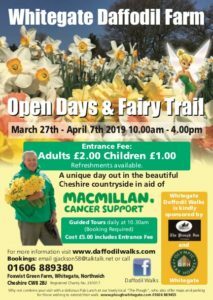 Daffodil Walks In Cheshire | Come and enjoy spring with us! If you love daffodils, Fairies, beautiful countryside, and a lovely day out, then come along to The Whitegate Daffodil Farm Open days. 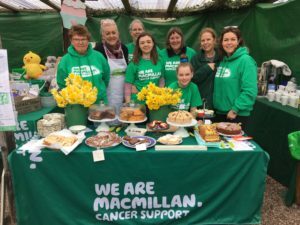 Enjoy a guided daffodil walk near the village of Whitegate, in the heart of the Vale Royal, Cheshire with all proceeds to Macmillan Cancer Support. The Open days and Daffodil walks are made during the height of the growing season – this year we are open from 27th March until 7th April 2019 10am – 4pm. 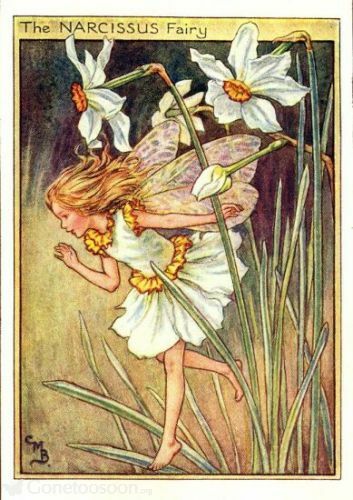 For the little ones follow the ‘Foxwist Fairy Trail’ and see the Magic Oak & Fairy Village. * Walks in the afternoon are available by special arrangement for pre-booked groups. A huge thanks to our sponsors for this year! The event is always needing extra hands, could you give up a few hours to help? From baking, serving cakes & refreshments to assisting with car parking. Here’s our 2019 flyer to download and share! A message from the Fairy Queen! The children were so good last year that I’ve invited more fairy friends to live where the daffodils grow!